The library has automatic doors and a hearing loop is installed. The library has assistive technology . Please see: Library services for people with disabilities, for further information. The library is situated in The Mansion, a listed building. We are a few hundred yards outside the town centre heading towards Dorking. The building is shared with the local Registry Office and the Youth Offending team. There is free parking for library users at the front and rear of The Mansion for up to two hours. There are two disabled spaces at the front. 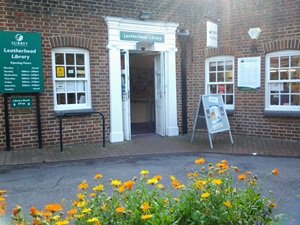 There are several pay and display car parks in Leatherhead within easy walking distance of the library. The nearest is behind the Church Hall in Church Road.